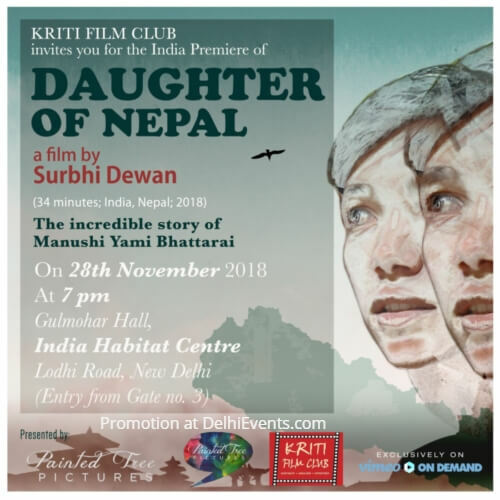 Event Description : DOC FILM : Kriti Film Club presents "Daughter Of Nepal"
The film will be followed by a discussion with the film maker! About the Film: This documentary is the story of Manushi Yami Bhattarai, the unassuming daughter of two formidable political leaders of Nepal. As her parents prepared to go underground for a Peoples' War against the Nepalese monarchy, nine-year-old Manushi was sent across the border to live under an assumed identity. The film takes a poetic look at a rarely seen side of a revolutionary movement and presents a refreshing view on family, society and love for one's homeland. About the Film Maker: Surbhi Dewan is an independent film maker. Her films connect personal portraits to larger socio-political landscapes. She has produced a number of short creative documentaries that have been showcased in film festivals across the world. Surbhi graduated with an MFA in film from Rochester Institute of Technology, New York, and received her BA degree in Political Science from Lady Shri Ram College, New Delhi. About the Kriti Film Club: This is an educational initiative of a not-for-profit organisation 'Kriti team'. The Kriti Film Club screens and shares documentary films on development, environment and socially relevant issues, in an effort to influence mindsets and behaviour towards an equitous, just and peaceful world. It also curates issue based film festivals and organises neighbourhood, school, college or institutional film shows. The Kriti Film Club has been screening documentaries regularly and independently since 2000 to promote 'thought-provoking cinema'.